The double-edged blade, engraved with lines following the contours of the thickened shoulder (ricasso) near the hilt, has a longitudinal channel on either side extending to mid-blade, which accommodates the two-part signature ANTONIVS/ME FECIT (Antonio made me) on the obverse and reverse respectively. 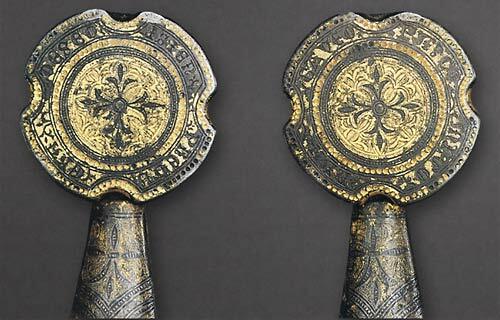 1 The hilt is constructed entirely of iron, engraved, punched, gilded, and in part blackened. It is ornamented with beaded and dotted bands outlining the contours and framing medallions that enclose rosettes. The cross-guard (quillons) is flat, curved downward, and flared at the ends, where there is a small ornamental notch; the arms of the hilt end with short ball tips projecting at right angles to the plane of the blade. The grip shows signs of having been shortened. The pommel, a disk quartered by notches, is inscribed on the obverse and reverse respectively: SIEN/PRE GV/ERA/DESEO and PAZ CO/MIGO/NVN/CA VEO (Siempre guerra deseolPaz conmigo nunca veo—“War is ever my desire/Peace with me I never see”). This bellicose legend is not well suited to Ferdinand, who used the famous motto Tanto monta. 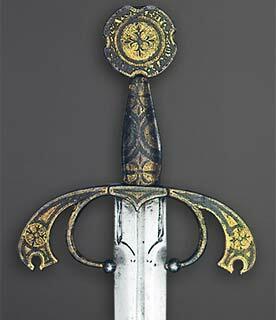 Nor is there any reason to suppose that it applies to Isabella, his wife, with whom this sword was associated in the middle of the nineteenth century, probably because of its small size. The tradition of Ferdinand's ownership goes back at least to the middle of the sixteenth century, but always with a "said to be," expressing some reserve. The sword is today without a scabbard. Evidently, this was refurbished from time to time; the black velvet covering noted in 1571 had by the end of the eighteenth century become red velvet trimmed with gold braid and fitted with a metal chape. In this context, besides the ceremonial sword GI in the Royal Armory (cat. 12), mention may be made of a sword of Ferdinand's in the cathedral of Granada, as well as an armor and a helmet of his in Vienna (Hofjagd- und Rüstkammer, inv. A 5, A 645). 1. The maker's mark lower down the blade has been attributed to the Biscotto family, Italian bladesmiths of Villa Basilica, near Lucca (Reid 1965), although no member of the family is known to have worked in Spain. Hispano-Flemish sources, on the other hand, point to the existence of a well-known master "Antonius" active in Spain—and by implication Spanish—who signed his blades with his Christian name and a mark identical or similar to this one (clearly depicted in a drawing of sword makers' marks, Senales de las buenas espadas Antiguas, Madrid, Biblioteca Nacional, MS 10806, fol. 102; L'Hermite  1896). 2. Archive General de Simancas, Contaduria mayor de Cuentas, primera epoca, legajo 1051, fol. 127. 3. "Una Espada corta de A caballo Ancha con una sesma de Recaco dorado con unas letreros que di$en Asia, Africa y Eu-ropa con una guarnicion sogueada de una puente dorada Antigua que dicen es de el Rey Don fernando el chatolico quel presento la duquesa de medina sidonia" (A short sword, for use on horseback, with a section of the gilded ricasso with letters reading Asia, Africa, and Europe, with a hilt with roped decoration having a gilt guard of old-fashioned type, said to be that of the king Don Ferdinand the Catholic, which was presented by the duchess of Medina-Sidonia). Abadfa 1793, p. 6 (A.2, no. 23); Jubinal and Sensi [ca. 1839], I, p. 15, pi. 16; Martfnez del Romero 1849, pp. 82-83, no. 1705; L'Hermite  1896, p. 293; Valencia de Don Juan 1898, pp. 197, 213-214, fig. 127; Gomez-Moreno 1923; Dean 1929, p. 83, no. 76, pi. xxvi; Aguado Bleye 1949; Reid 1965, p. 8; Boccia and Coelho 1975, pp. 339, 348, 355, nos. 124, 184, 248; Thomas and Gamber 1976, pp. 118-120, pis. 52, 53; Norman 1980, p. 80. Quite interesting that the decoration is very much to Moorish taste. Apropos, of course. beautiful and deadly just like my ex-wife!